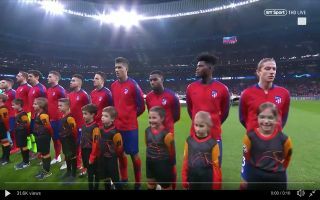 Atletico Madrid superstar Antoine Griezmann showed his class with a lovely gesture before Atleti went on to win their Champions League clash against Monaco. The World Cup winner helped tie the laces of his mascot as both teams lined up before the game kicked off. If there was anyone out there who wasn’t a fan of Griezmann before today, they certainly will be now. Griezmann also displayed his lethal ability in front of goal this evening, the Frenchman displayed great awareness to get into space and score in Atleti’s 2-0 win.